Use one of these free entertainment center plans to give you a great place for your TV, DVD players, cable/satellite box, and whatever other media devices you have. These entertainment center plans will help you build not only a functional but a beautiful piece of furniture that you'll be able to enjoy for years and years to come. Each of these free entertainment center plans include diagrams, blue-prints, material lists, cut lists, written directions, and photos to help you succeed with this intermediate to advanced woodworking project. If you enjoy these plans, you may also like some of the other free woodworking plans that I've collected, such as ones that walk you through building a bookcase, coffee table, wine rack, tiny house, desk, kitchen island, home bar, workbench, bunk bed, bird house, shed, pergola, little free library, greenhouse, porch swing, deer stand, jewelry box, Adirondack chair, router table, rabbit hutch, and cabin. This is a relatively small entertainment center with the topmost surface reserved for a TV as well as a shelf and two large doors. What I love about this plan is that every piece of the entertainment center is color-coded so it's super simple to refer to a specific piece out of the instructions and see where it applies in the whole project. It makes the construction process a lot simpler. In addition to the general drawings are specific steps with real images. This is also helpful to get an idea of how the entertainment center should look with each step. 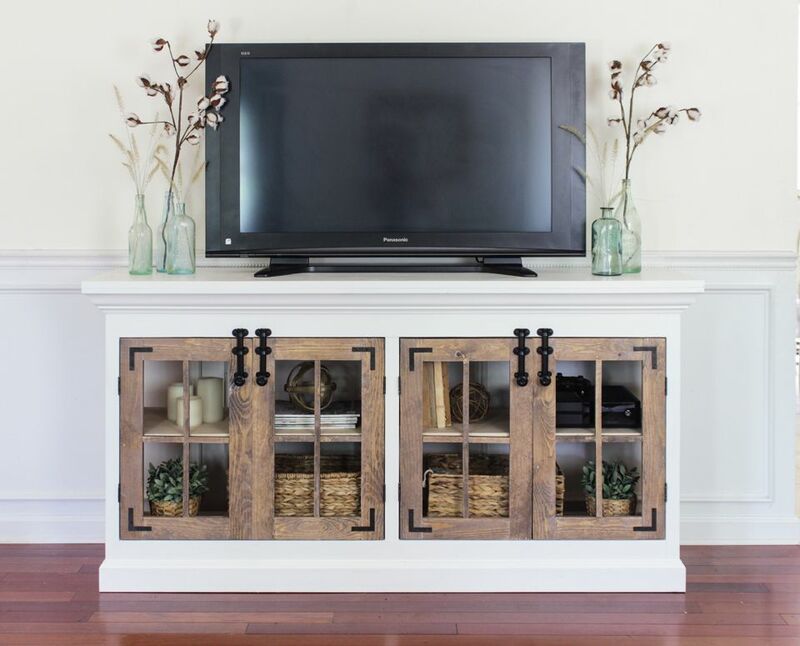 Here's a DIY entertainment center plan for a large farmhouse style media cabinet. It features four doors with shelving inside for storage and black hardware. This is a great looking media center plan that really makes the farmhouse look accessible for whatever style the rest of your home is. Included in the free plan are a step-by-step building list, a tool list, a materials list, and a parts/cut list. There's also a video to help; you get that farmhouse finish on the wooden doors. Her Tool Belt has this awesome entertainment center plan that has plenty of space and even deep drawers located on both sides of the bottom. The estimated cost to build this entertainment center is $300. I really like the plans at Her Tool Belt because they include lots of up-close illustrations for a clear understanding of what you need to do to complete the project, including the specific dimensions of each piece and how they all fit together. This plan also includes a table that shows all the cuts you need to make for this entertainment center, including the quantity, length, width, and thickness of each piece. The instructions for building the different pieces of the entertainment center (the drawers, shelves, doors, and bridge) are broken up into their own articles, which you'll find near the bottom of this plan. The Design Confidential's entertainment center has a rather simple design - it has 6 drawers, stands at a height of 2.2 feet, and is 6.75 feet wide. This plan is easy to follow because the tools, lumber, materials, cut list, and instructions are all neatly organized in their own sections, which makes reading through it very easy and simple to understand. Illustrations of each step of the building process are shown along with written instructions and highlighted areas of the drawings show what you should be doing at each step, which really simplifies the entire construction process. Rockler has this other free plan for building an entertainment center with shelves surrounding it for books, a clock, movies, or other items. Download the diagrams and materials list for this entertainment center to understand what you need and how the parts will work together. There are also written instructions and pictures you can refer to throughout the steps. Like most of these free entertainment center plans, this one shows real images you can follow along with as you read through the instructions. Before starting, you can read through the cut list so you can gather all the necessary materials before you dive in. This particular plan is for an entertainment center that is 4.5 feet long. As you can see from the picture, there are six shelves that can be used for things like movies and a DVD player. A "storage" area for the cables is built in the back to keep them out of the way. Lowe's describes building this entertainment center in both text and picture form as well as through videos. Very detailed drawings, a full tools and materials list, and a cut list give an overview to what you'll be doing before you even begin. The estimated time to complete this project is 1-2 weeks, and it should cost under $500. Rockler has this unique entertainment center plan that supports sliding out the TV and shelves to give easy access to all the cables. In addition to the six shelves under the TV are four drawers on either side of the entertainment center. A PDF of an exploded view of the entertainment center with a matching materials list is also available. This free plan from Wayne of the Woods is for building an entertainment center that is a little over 4 feet wide that stands 2.5 feet off the floor. This is an easy plan to follow because there are very clear illustrations showing the different sides and dimensions of the entertainment center, which gives a simple way to view how it will turn out. There are also detailed written instructions for building each piece.